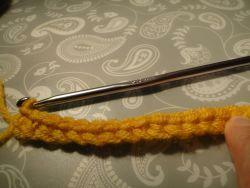 Single crochet stitch is king! It's sweet, it's neat, and you can do so much with it. Why do I love it so much? Well, the stitches sit very close to each other. This is ideal for making little purses, bags, or cozies. 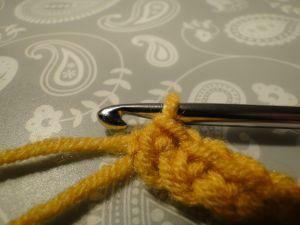 It's used in Amigurumi and also for many household items where you need a stiffer, closer worked fabric as in dishcloths. 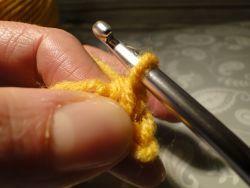 You'll find single crochet used as an edging, either by itself, or with a fancier stitch worked on top of it. And... it's so easy. Ready? Off we go! 2. 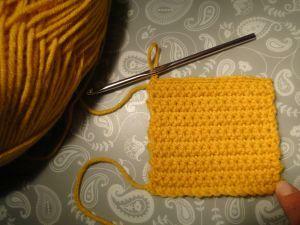 Now, we are going to make 15 single crochets into this row. We will miss the 16th chain and use it as a "turning chain." 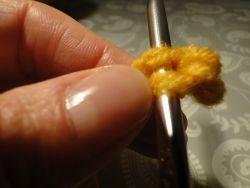 To the left of the loop on my hook is the 16th chain you made which is now the first chain of our new row. To the left of that is the 15th chain that is now the second chain of our row. I've put some dark yarn through that stitch so you can see it. 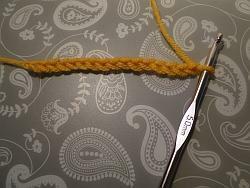 So, as we go into our first row of single crochet, we will miss the first chain and work into the second chain from the hook. 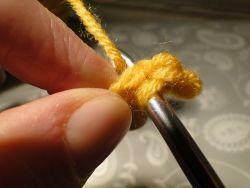 Some crocheters insert their hook into the chain stitch under only one loop. They are one-loopers. And in my experience, unless otherwise instructed, patterns expect you to work under the top two loops. 3. I hope you've left the first chain empty - no stitch there... awwww! Put the hook through the second chain from the hook. Now you have two loops on the hook - your original loop at the bottom, and the loop you've just pulled through on the top. Yarn pulled through two loops on hook. 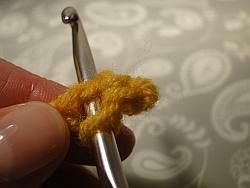 Hook under two loops of next chain. 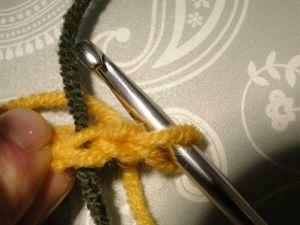 Pull yarn through the loops. 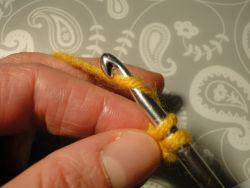 Pull yarn through two loops on hook. 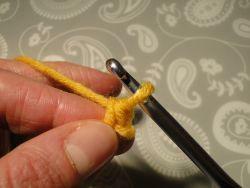 See the last stitch I worked, just under my hook? 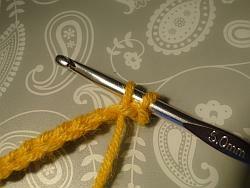 That is where we will work our next single crochet in a moment. But first we have to turn! Working the Second Row and Beyond! 1. 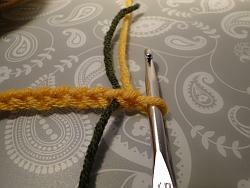 Yarn round hook and make one chain. This is your turning chain. 1 chain worked - the "turning chain." 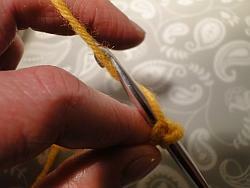 The dark thread shows where to work your first stitch of the next row. 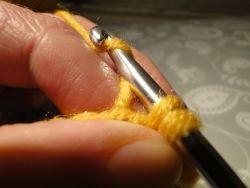 The stitch markers show the first and last stitch of that row. 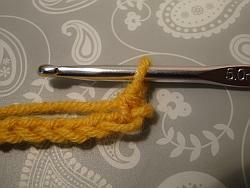 If I'm working bigger pieces, this can be very useful, depending on the kind of stitch/pattern you are working. 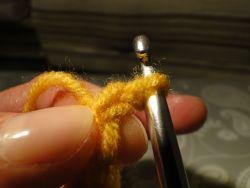 You can also use stitch markers to help you count stitches along a very long row. Find out more about stitch markers here! 3. 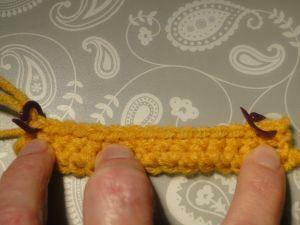 Work your next row: Work 1 chain, turn, then single crochet into each stitch along. Notice that the tail end of the yarn - the end yarn at the bottom where you began your chains at the start - is on the left. This shows you you're looking at the "right side" of the work. If you were making a sweater, this is the side that everyone would see, and the back of your work would be on the inside of the sweater.